Sometimes, I discover new things. Occasionally, I really like these new things. Rarely, these new things can be described as life-altering. In Amsterdam, I discovered two such rare things. People, meet Wok to Walk and Maoz. W2W and Maoz, meet the people. Wok to Walk is an ingenious Asian-inspired dining establishment, with one location handily positioned on the same street as my hostel (dangerous). You have the ability to customize a dish - choosing the noodles/rice, meats, vegetables, and sauce - that is then cooked in front of you. Just take a look at their menu and you'll see that this is the kind of place you can visit again and again to try out a variety of options. And then there is Maoz. Thankfully, there are currently Maoz locations in the States, namely on the East Coast and Berkeley, California. The next time I get to D.C.... I will need my fix. 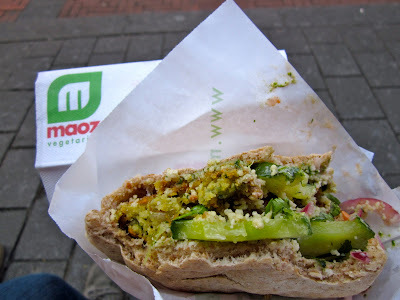 Maoz is a vegetarian falafel restauarant. You choose to make either a salad or pita, and then have free reign over a salad bar loaded with different vegetables and salads. Maybe this description doesn't do Maoz justice, but it's the best I can do. I am seriously considering opening a Wok to Walk wherever I move after I graduate, just for a little money on the side. I promise you it would be profitable. Any potential business partners, just let me know.